Honour roll unveiled 1921, St Stephen’s Church, Sandy Bay . Who was Nellie Payne? “SANDY BAY SOLDIERS’ MEMORIAL UNVEILING CEREMONY. 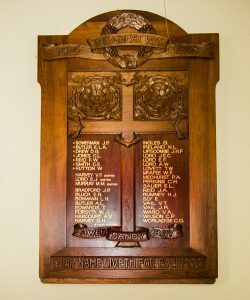 The ceremony of unveiling a soldiers’ memorial tablet was held in the St. Stephen’s Church room at Lower Sandy Bay yesterday afternoon. A large number of people attended. The tablet, which is of Blackwood, handsomely carved, has been erected by the residents of lower Sandy Bay in memory of the soldiers and sisters who went out to the war, and as a token of esteem of the women and men who had given their services to the various patriotic associations and leagues during the war. The thirty-six names, painted in gold, are as follows:-J. V. Bowerman, E. J. A. Butler, D. G. Drew, C. L. Jones, F. TV. Reid, C. E. Smith (killed in action), V. V. Harvey (sister), E. J. Lord (sister), M. M. Murray (sister), J. P. Bradford, E. N. Black, L. H. Bohmann, A. L. Butler, T. Edwards, W. J. Forsyth, A. V. Harcourt, D. H. Harvey, G. Ingles, N. L. Ireland, J. H. F. Lipscombe, J. E. C. Lord, E. F. Lord, A. W. Lord, T. W. Lovett, W. F. McAfee, V. A. Medhurst, C. H. Perkins, E. L. Salier, J. A. Reid, H. J. Rumney, E. Sly, V. T. Vail, J.R. Vail, V. A. Ward, C.P. Wilson, C. G. Worladge. An address was also given by the Rev. T. Quigley, rector of St. George’s parish, and hymns and solos brought the function to a close. Thank you to the sponsors, volunteers, and businesses that made the 2015 "Who was Nellie Payne?" exhibition such a success, including the following.